Securely hang your frames with OOK’s KidSafe hanger. This unique hanger comes with a clip the tightly fastens your art. Also great for earthquake prone areas. Brass finished and holds up to 75lbs. 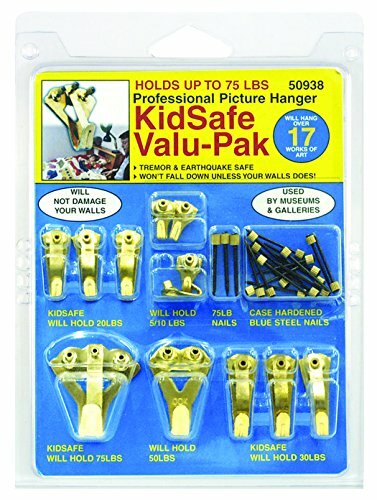 Let OOK’s KidSafe Hanger Valu-Pak Kit provide you with peace of mind. This 17 piece kit includes 10lb hangers, 20lb hangers, 30lb hangers, a 50lb hanger, and a 100lb hangers. Each hanger come with OOK Blue Steel Nails, designed to leave only a pinhole in walls. Kidsafe, Tremor and Earthquake Safe. Hang up to 17 works of art.